At 48.3 m. US 20 turns sharply right, ascends a steep hill, and passes charming Laurel Lake (bathing, fishing), 49.2 miles. Back of the lake to the northwest amid forested green hills is The Mount, (pictured here) home of Mrs. Edith Wharton, the celebrated novelist. Henry James was a frequent guest here. US 20 gives glimpses of Mt. Stockbridge and Mt. Baldhead (L); far across Lake Mahkeenac (L), 49.9 m., is the red-roofed castle like villa in which Andrew Carnegie was living when he died in 1919. It is now a Jesuit novitiate, Shadowbrook. Lenox, 51.8 m. (see Tour 17), is at the junction with US 7 with which US 20 unites, to Pittsfield, 58.4 m.
(TheOldLibrarian - from Tour 17) Lenox, (pop. 2706, sett. about 1750), was named for Charles Lenox, Duke of Richmond, a defender of Colonial rights. Industries in town included an iron foundry, marble works..., but today only two tobacco mills operate. 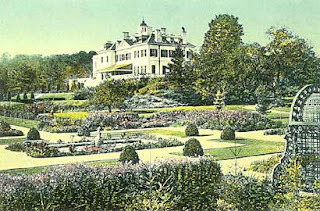 The town early became a summer resort with fine hotels and magnificent homes.